Tilting the lens is a technique that is not widely used but can certainly improve your shots and could be the answer to some focusing issues. Tilting – this can create soft focus and can also bring more of the subject into focus without sacrificing the aperture size. This effect is called the Scheimpflug Rule, the camera lens is tilted along its axis and facing the subject plane. The standard prime or zoom lens have glass parts which stay parallel to each other, with the distance between them increasing or decreasing in order to focus the image in the sensor. The lens always stays parallel with the image plane and sensor to keep the image sharpness even and consistent. If you tilt the lens at another angle to the sensor plane, you can create interesting visual results. One of these is selective focus, which is allowing only an area in the image to be sharp and then captured by the sensor. This area in focus is positioned within the focal plane by changing the focal length. Selective focus can be used to emphasize certain details and disregard others, which can be used to guide the viewer to a certain emotional response. If you tilt the image away from the subject plane, the upper and lower areas of the image become selectively unfocused regardless of where the lens is facing. The effect becomes more obvious with the more tilt you give the lens. 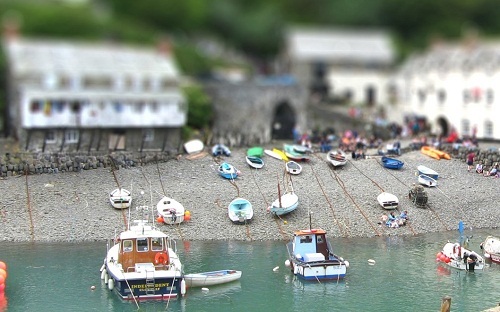 When set to infinity, this tilting technique can make an image appear as if the scene is in miniature, especially with those showing top view or from afar. With this effect, the image projects the illusion of being in macro. People appear tiny, buildings look like models and cars and trains look like toys. Another effect resulting from tilting is that it allows a wider focused area without adjusting the aperture. When the lens is tilted toward a slanting subject, the subject can appear to be entirely in focus. By using an aperture such as f/4, you can push the depth of field further with the tilting technique while allowing for a faster shutter speed. The added advantage to this is you have the option to handhold the camera instead of relying on a tripod. 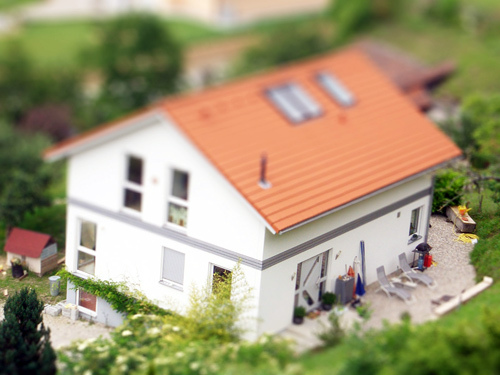 The tilt shift technique is beneficial in close-up photography, such as when photographing small items such as jewelry. The sharp area can be strategically placed exactly where you want the viewer to look, and if the images are for commercial purposes, this can be a great asset. This is also useful in landscape photography where one can increase the depth of field without decreasing aperture stop. A scenario would be a low-light situation where overall image sharpness is needed. 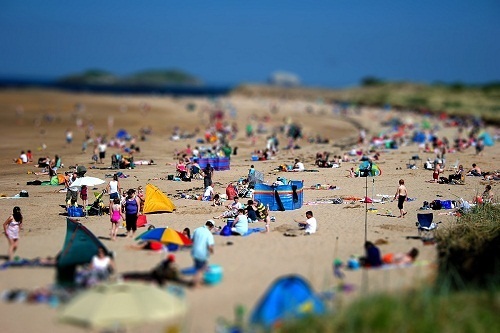 Using the tilt shift approach, one can use an aperture of f/8 to cover a wide focused area as one would with an f/16, with the advantage of letting more light into the sensor. These varied options for depth of field and shutter speeds make the tilt lens popular among landscape photographers. This entry was posted on Friday, January 28th, 2011 at 10:06 am	and is filed under Articles, Composition, Photography Techniques. You can follow any responses to this entry through the RSS 2.0 feed. You can leave a response, or trackback from your own site.